This chapter examines the deadly impact of the Afghan Taliban’s targeted killing program on the civilian population in Afghanistan. The first section of the chapter analyzes the criteria used by the Taliban for determining what they believed were legitimate military targets. 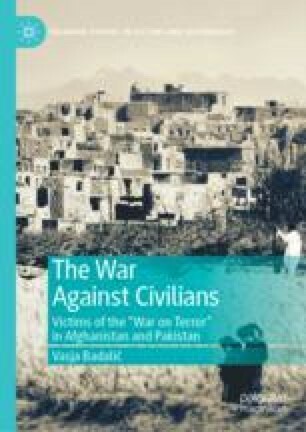 The section includes a detailed analysis of the reasons provided by the Taliban to legitimize targeting specific categories of civilians (e.g., civilian contractors working for U.S./ISAF forces and the Afghan regime, pro-government religious leaders, judicial officials, teachers at government-run schools). The second section shows how the too-broad criteria for determining targets, which necessarily led to indiscriminate attacks against civilians, ignored the standard definitions of legitimate military targets in non-international armed conflicts, and, consequently, violated the principle of distinction between combatants and civilians. AIHRC (Afghanistan Independent Human Rights Commission). 2008. Insurgent Abuses Against Afghan Civilians. Kabul: AIHRC. http://www.refworld.org/docid/4a03f7a82.html. Accessed on 12 December 2017. Alston, Philip. 2010. Report of the Special Rapporteur on Extrajudicial, Summary, or Arbitrary Executions: Study on Targeted Killings. Geneva: UN Human Rights Council. http://www2.ohchr.org/english/bodies/hrcouncil/docs/14session/A.HRC.14.24.Add6.pdf. Accessed on 12 September 2017. Azami, Dawood. 2013. “The ‘Dissenting’ Clerics Killed in Afghanistan.” BBC, November 19. http://www.bbc.com/news/world-asia-22885170. Accessed on 1 October 2017. ———. 2011b. The Layha: Calling the Taleban to Account: Appendix 1. The Taleban Codes of Conduct in English. Kabul: Afghanistan Analyst Network. http://www.afghanistan-analysts.org/wp-content/uploads/downloads/2012/10/Appendix_1_Code_in_English.pdf. Accessed on 1 October 2017. Giustozzi, Antonio, and Christoph Reuter. 2011. The Insurgents of the Afghan North. Kabul: Afghanistan Analyst Network. http://www.afghanistan-analysts.org/wp-content/uploads/downloads/2012/10/AAN-2011-Northern-Insurgents.pdf. Accessed on 18 December 2017. Gopal, Anand. 2010. The Battle for Afghanistan: Militancy and Conflict in Kandahar. Washington, DC: New America Foundation. http://www.operationspaix.net/DATA/DOCUMENT/4473~v~The_Battle_for_Afghanistan__Militancy_and_Conflict_in_Kandahar.pdf. Accessed on 18 December 2017. Harooni, Mirwais. 2013. “Suspected Taliban Bomber Targets Afghan Court, Kills 17.” Reuters, June 11. http://www.reuters.com/article/us-afghanistan-attack-idUSBRE95A0I320130611. Accessed on 1 October 2017. Huma, Yusuf. 2010. “Christian NGO Identifies Killed Aid Workers, Vows to Stay in Afghanistan.” The Christian Science Monitor, August 9. https://www.csmonitor.com/World/terrorism-security/2010/0809/Christian-NGO-identifies-killed-aid-workers-vows-to-stay-in-Afghanistan. Accessed on 24 December 2017. Human Rights Watch (HRW). 2007. The Human Cost: The Consequences of Insurgent Attacks in Afghanistan. New York: HRW. https://www.hrw.org/reports/2007/afghanistan0407/afghanistan0407webwcover.pdf. Accessed on 24 December 2017. IRIN (Integrated Regional Information Networks). 2011. “Afghanistan: Government Hails Taliban Decree on Schools,” March 28. http://peacenews.org/2011/03/29/afghanistan-government-hails-taliban-decree-on-schools-irin-asia/. Accessed on 21 December 2017. Islamic Emirate of Afghanistan. 2013a. “Rejoinder About the Recent Report of the UNAMA Regarding the Civilian Casualties.” July. http://jihadology.net/2013/07/31/new-statement-from-the-islamic-emirate-of-afghanistan-rejoinder-about-the-recent-report-of-the-unama-regarding-the-civilian-casualties/. Accessed on 8 January 2017. ———. 2013b. “An Open Letter to the UNAMA About the Biased Behavior of This Organization.” February 25. https://blogs.mediapart.fr/lynx/blog/010313/open-letter-unama-about-biased-behavior-organization. Accessed on 8 January 2017. ———. 2014. “Regarding the Commencement of the Annual Spring Operation Named ‘Khaybar’.” May 8. http://jihadology.net/2014/05/08/new-statement-from-the-islamic-emirate-of-afghanistan-regarding-the-commencement-of-the-annual-spring-operation-named-khaybar/. Accessed on 14 December 2017. ———. 2015. “Statement by the Leading Council of the Islamic Emirate Regarding the Inauguration of Spring Operations Called ‘Azm’ (Resolve).” http://jihadology.net/2015/04/22/new-statement-from-the-islamic-emirate-of-afghanistan-regarding-the-inauguration-of-spring-operations-called-azm-resolve/. Accessed on 12 December 2017. Jackson, Ashley, and Antonio Giustozzi. 2012. Talking to the Other Side: Humanitarian Engagement with the Taliban in Afghanistan. London: Humanitarian Policy Group. https://www.odi.org/sites/odi.org.uk/files/odi-assets/publications-opinion-files/7968.pdf. Accessed on 24 December 2017. Johnson, Kay, and Jessica Donati. 2014. “Kabul Police Chief Quits After South African Family Dies in Taliban Attack.” Reuters, November 30. https://www.reuters.com/article/us-afghanistan-attacks/kabul-police-chief-quits-after-south-african-family-dies-in-taliban-attack-idUSKCN0JE09L20141130. Accessed on 1 October 2017. Mashal, Mujib, and Jawad Sukhanyar. 2017. “Taliban Target: Scholars of Islam.” The New York Times, May 28. https://www.nytimes.com/2017/05/28/world/asia/uptick-in-killing-of-religious-scholars-as-taliban-look-to-curtail-their-influence.html?mcubz=3. Accessed on 1 October 2017. Nordland, Rod. 2013. “Taliban Bomb Attack Kills Court Workers in Kabul.” The New York Times, June 11. http://www.nytimes.com/2013/06/12/world/asia/afghanistan.html. Accessed on 10 October 2017. Partlow, Joshua. 2010. “Devastated Christian Aid Group Pledges to Continue Work in Afghanistan.” The Washington Post, August 9. http://www.washingtonpost.com/wp-dyn/content/article/2010/08/08/AR2010080801338.html?sid=ST2010080801343. Accessed on 24 December 2017. Pillay, Verashni. 2014. “South African Pastor Killed in Afghanistan Suicide Bombing.” Mail & Guardian, November 30. https://mg.co.za/article/2014-11-30-south-african-pastor-killed-in-afghanistan-suicide-bombing. Accessed on 31 December 2014. Protocol Additional to the Geneva Conventions of 12 August 1949, and Relating to the Protection of Victims of Non-International Armed Conflicts (Protocol II), 8 June 1977. https://ihl-databases.icrc.org/ihl/INTRO/475. Accessed on 31 August 2018. RFE/RL (Radio Free Europe/Radio Liberty). 2013. “Taliban Attacks Western Afghan Courthouse, Killing at Least 53.” April 3. http://www.ecoi.net/local_link/243561/366933_de.html. Accessed on 10 October 2017. Stanekzai, Sharaf. 2013. “Afghan Taliban Kill 44 in Suicide Attack on Courtroom.” Reuters, April 3. http://www.reuters.com/article/us-afghanistan-blast-idUSBRE9320OE20130403. Accessed on 10 October 2017. “Taliban Storm Afghan Court, Kill Five, After Vowing Revenge for Executions.” 2016. Reuters, June 1. https://www.reuters.com/article/us-afghanistan-attacks/taliban-storm-afghan-court-kill-five-after-vowing-revenge-for-executions-idUSKCN0YN3TA. Accessed on 14 December 2017. UNAMA (United Nations Assistance Mission in Afghanistan). 2009. Afghanistan: Annual Report on Protection of Civilians in Armed Conflict, 2008. Kabul: UNAMA. https://unama.unmissions.org/sites/default/files/unama_09february-annual20report_poc202008_final_11feb09.pdf. Accessed on 19 December 2017. ———. 2010. Afghanistan: Annual Report on Protection of Civilians in Armed Conflict, 2009. Kabul: UNAMA. https://unama.unmissions.org/sites/default/files/engi_version_of_poc_annual_report_2011.pdf. Accessed on 30 December 2017. ———. 2011a. Afghanistan Annual Report 2010: Protection of Civilians in Armed Conflict. Kabul: UNAMA. https://unama.unmissions.org/sites/default/files/engi_version_of_poc_annual_report_2011.pdf. Accessed on 30 November 2017. ———. 2011b. Afghanistan Midyear Report 2011: Protection of Civilians in Armed Conflict. Kabul: UNAMA. https://unama.unmissions.org/sites/default/files/2011_midyear_poc.pdf. Accessed on 12 December 2017. ———. 2015. Afghanistan Annual Report 2014: Protection of Civilians in Armed Conflict. Kabul: UNAMA. https://unama.unmissions.org/sites/default/files/2014-annual-report-on-protection-of-civilians-final.pdf. Accessed on 28 September 2017. ———. 2016. Afghanistan Annual Report 2015: Protection of Civilians in Armed Conflict. Kabul: UNAMA. https://unama.unmissions.org/sites/default/files/poc_annual_report_2015_final_14_feb_2016.pdf. Accessed on 1 October 2017. ———. 2017. Afghanistan Annual Report 2016: Protection of Civilians in Armed Conflict. Kabul: UNAMA. https://unama.unmissions.org/sites/default/files/protection_of_civilians_in_armed_conflict_annual_report_2016_final280317.pdf. Accessed on 1 October 2017.